Welcome to Part 2 of How To Create Your Personal Annual Report & Set Your Yearly Goals. By now I’m hoping you have completed or at least started your Annual Review. So here comes to fun part…setting next year’s goals and expectations. Part of the reason I want you to have done part 1 first is because that’s going to be your formula for creating part 2. First look at last year’s quantitative accomplishments. If you have 500 Instagram followers how many do you think you could realistically gain in the next year? Look at the numbers, can they be better? Set a realistic goal based on your accomplishments from the previous year. If you gained on average 25 followers a month can you step that up to 30? For example: Last year I published 200 articles and this year I hope to publish 262. Look at your list of last year’s nonquantitative accomplishments. Are they tasks you would like to repeat? Are they part 1 of of a 2 part accomplishment. For example did you get accepted into an exclusive community in your niche? Would you like to hold a leadership role in the community? Would you like to produce content for them? Last year I had the privilege of working with multiple brands and being published on different websites. Both of these did wonders for my traffic, naturally I want to do more in the new year. Want access to exclusive content and regular updates? Join my mailing list and receive my free Writer’s Block Guide. Come up with a short statement that reflects your ultimate goal. The idea isn’t that you will accomplish your ultimate goal in the next year (depending on the goal it may take longer) it’s to think about what steps you need to take in the following year to get there. 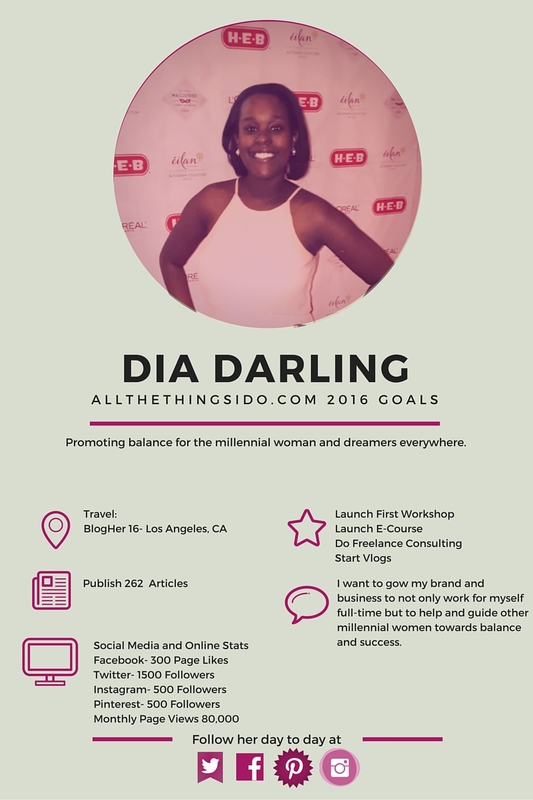 I want to grow my brand and business to not only work for myself full-time but to help and guide other millennial women towards success and balance. Once you have that statement think of things you can do in the next year to step towards that goal. For me, that includes launching my first e-courses and webinars. What would help you move towards these goals? Do you need to gain more clients? How would you go about doing this? What tasks would you need to complete to make this happen? Do you need to go to go to more networking activities? Should you create a mastermind group? Then put it all together and you have not only a plan outline but something to hold yourself accountable for next year. Do you make an annual plan? Don’t forget to check out this awesome tutorial on Canva, the tool I used to create my annual report and 2016 goals.